It definitely wasn’t casual Friday for President Putin, who spoke for hours at the St. Petersburg International Economic Forum (SPIEF) on the hottest topics on the global agenda, including Russia’s relations with the EU and Washington. 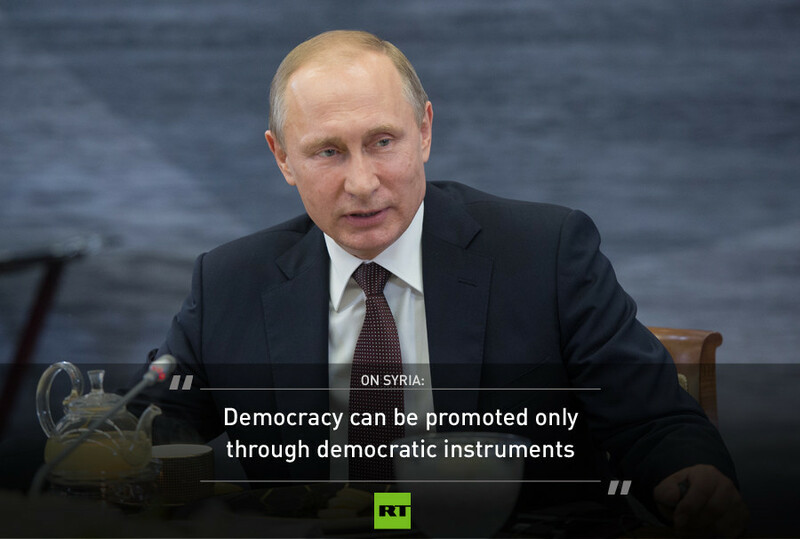 While saying that such a powerful state could be of benefit to the world, including Russia, Putin noted that the problem with the US is its tendency to interfere in the affairs of other countries. “We need [the US]. But we don’t need them constantly interfering in our affairs, telling us how to live, and hindering Europe in building relations with us,” he said. The economic sanctions that Moscow introduced as a response to the West imposing restrictions on Russia after the coup in Kiev have not affected America in any way, but they have done harm to Europe. 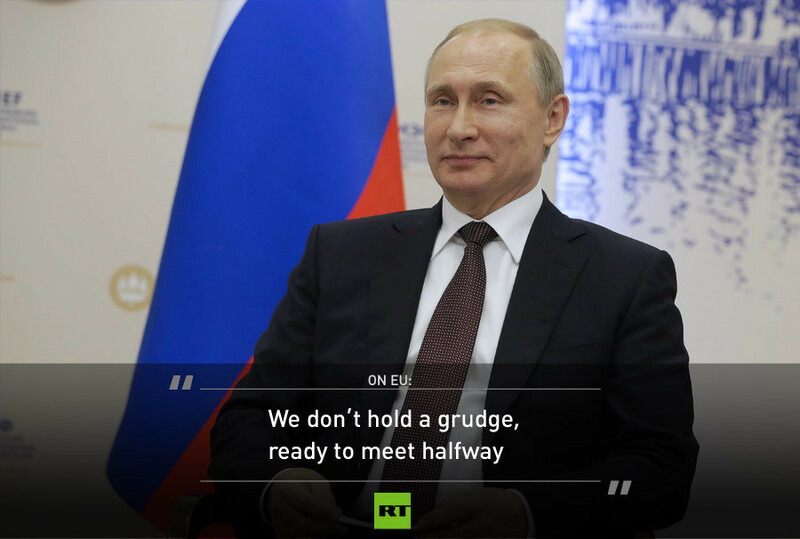 “[Sanctions] have zero effect [on US], but Americans tell their partners to endure them,” Putin said, adding that he doesn’t understand why the EU has to suffer. “Our recent meetings with representatives of German and French business circles have proven that European business is willing and ready to cooperate with our country. Politicians need to meet the businesspeople halfway, and show wisdom, foresight, and flexibility. We need to regain trust in Russian-European relations and to restore the level of interaction,” he said. 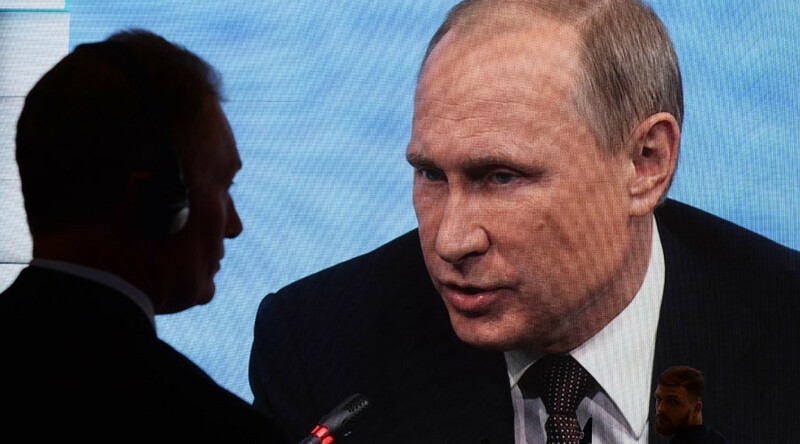 Russia has also been forced to respond to NATO’s expansionist policy, Putin said, adding that he doesn’t understand why the military alliance keeps creeping closer to Russia’s borders. “The Soviet Union is no more, the Warsaw Treaty [between the USSR and eastern European countries] has ceased to exist, so why does NATO need to constantly broaden its infrastructure and move towards Russia’s borders. Now they’re taking in Montenegro. Who has threatened Montenegro?” Putin wondered, laughing. 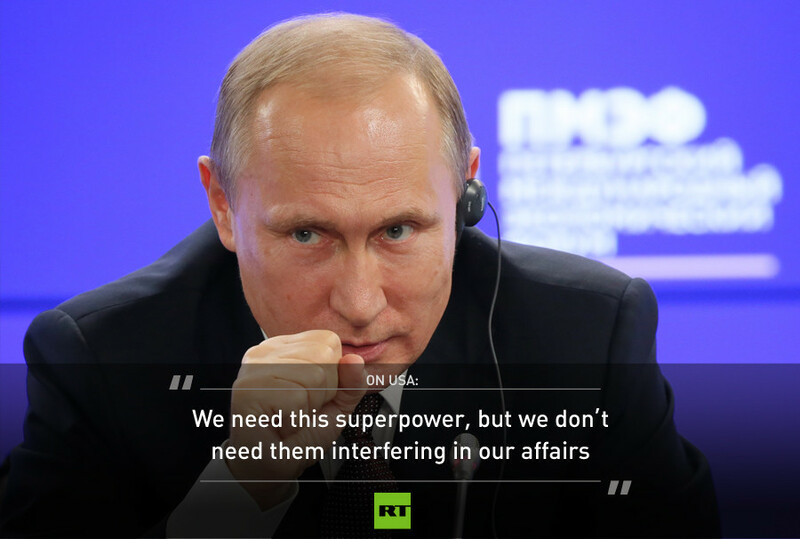 The alliance has “an absolutely slapdash attitude to our position on anything,” the Russian leader said, adding that it was the US that had unilaterally quit the missile defense treaty, which was initially signed to “provide strategic balance in the world.” Yet, Putin reassured the international community that he does not want to proceed to a new Cold War, as “no one wants it.” “However dramatic the logic of the development of international relations might seem on the outside, it’s not the logic of global confrontation,” he explained. 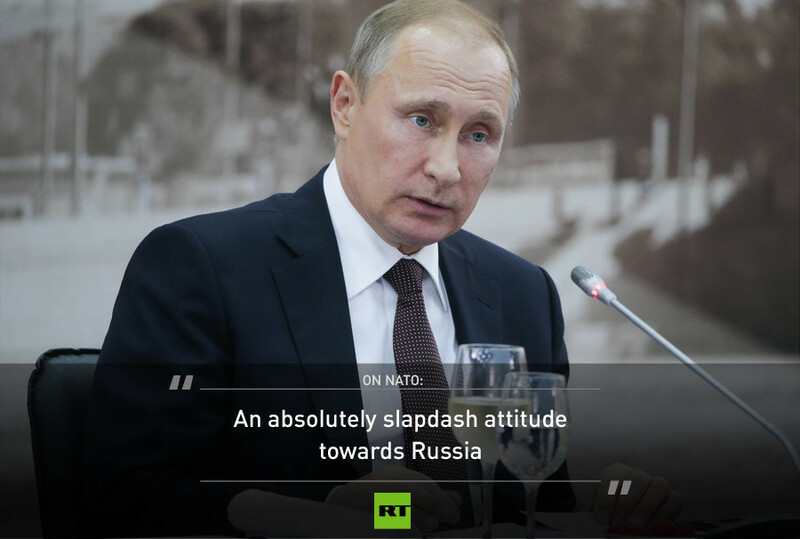 Putin reiterated that the controversial US missile shield in Eastern Europe constitutes a threat to the balance of power. “We will perfect our missile strike capability, to preserve balance, only because of that,” he stressed. 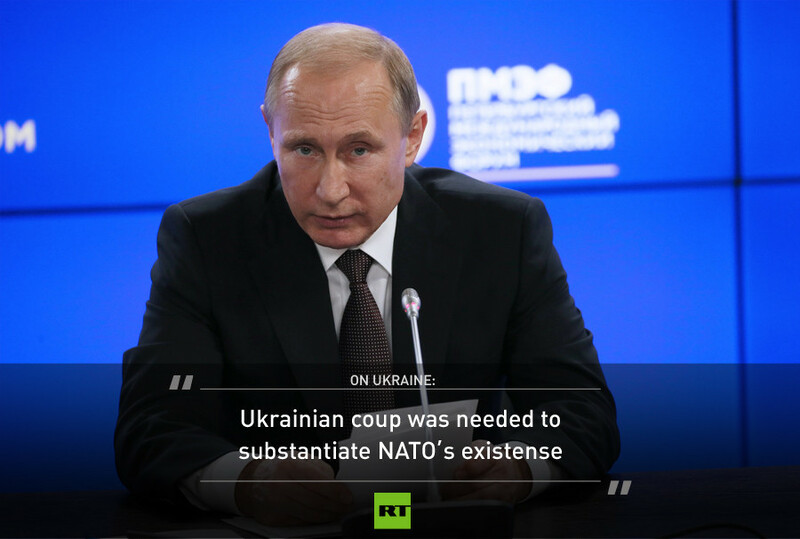 However, NATO “needs a foreign enemy, otherwise what would be the reason for the existence of such an organization.” The whole conflict was forced on Ukraine “to substantiate the very existence of the North Atlantic alliance,” the Russian president concluded.